Over the past 10 years, land seismic acquisition has changed significantly. Nodal/cable-less systems have broadly replaced cabled systems, vibroseis sources have replaced explosive sources even in areas with difficult terrain, and high-density seismic programs are becoming commonplace. This article, based on the Chief Geophysicists Forum presentation: “Top 5 Innovations in Geophysical Acquisition”, will provide a brief overview of some of the “new-to-Canada” technologies. 10-Hz geophones are currently the standard used in Canada, 5-Hz geophones are becoming more common-place (Figure 1). Testing results indicate that more low frequencies (<15 Hz) and mid-range frequencies (80-120 Hz) can be achieved with 5 Hz geophones (Figure 2), but 10 Hz geophones tend to out-perform 5 Hz analog geophones at frequencies >150 Hz. Andrea Crook, Chief Geophysicist at OptiSeis Solutions Ltd., graduated from the University of Manitoba in 2002 with a B. Sc. in Geophysics. She began her career as a seismic processor at Shell Canada and later moved into the Geophysical Operations group where she honed her survey design skills and worked on many experimental seismic acquisition projects. Building on the knowledge she gained at Shell, in 2008 she joined RPS Boyd PetroSearch and consulted on a variety of seismic programs. In 2011, Andrea co-founded OptiSeis Solutions Ltd., a geophysical acquisition software and survey design company focused on developing innovative acquisition solutions for acquiring high resolution seismic data. 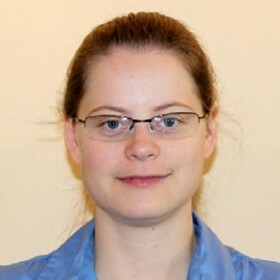 She is responsible for seismic acquisition design and sub-surface modeling of Canadian and international seismic surveys as well as seismic acquisition software development.